When Annalise Burke and her mom noticed a stray cat wandering around outside their home one night, they thought it was a little strange. The family lives in a rural area of Idaho, and usually don’t see cats wandering around their property. 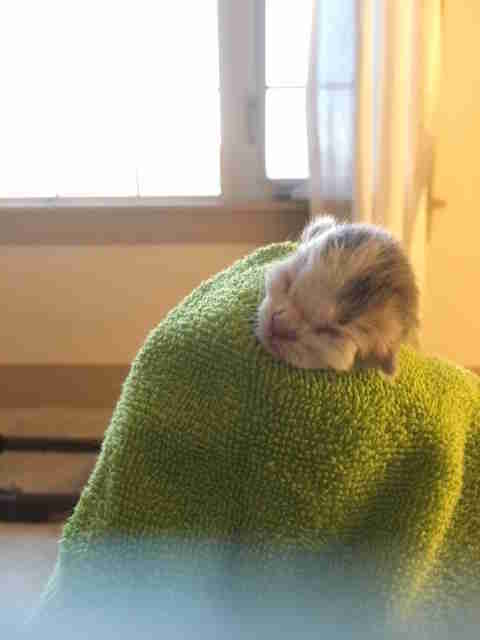 The next morning, they went out to look for the cat to take her to the local humane society — and instead found two tiny newborn kittens. Unfortunately, one of the kittens hadn’t survived, and the other one was clearly very sick. 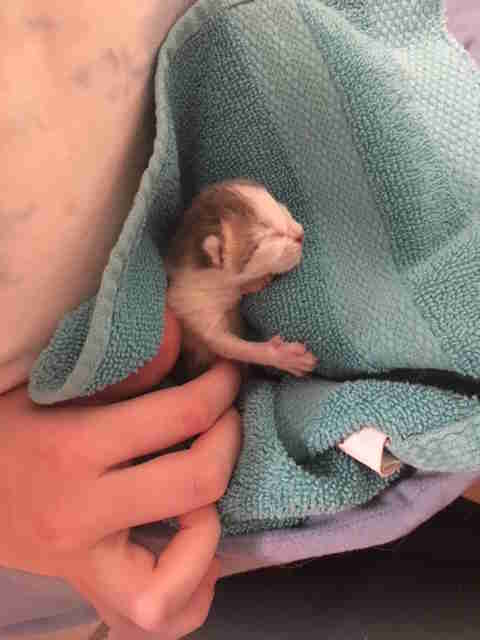 While they wanted to wait to see if the mom would come back for the kitten, they also knew the kitten desperately needed help, so they took her in while they waited for the mother cat to reappear. When they finally spotted her again, they scooped her up and rushed her and her kitten to the local humane society. Burke and her mother returned home from dropping off the two cats — and suddenly heard faint meows coming from underneath their shed. 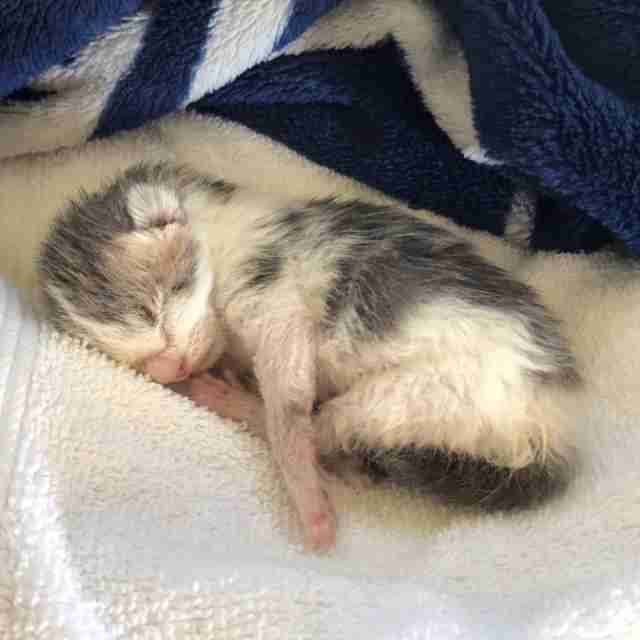 Shocked, they began digging underneath, and uncovered a third kitten, covered in dirt and fighting for her life. Burke and her mom rushed the tiny, sick kitten, whom they later named Gemma, into the house and began cleaning her up and trying to feed her. They realized the poor kitten had been eating rocks and dirt to try and survive, which had made her even sicker than she already was. By the time they found her and got her inside, the humane society and local veterinarians were already closed, so they stayed up all night with Gemma, doing everything they could think of to try and save her life. The next day, Burke and her mom rushed Gemma to the vet, who told them her chances weren’t good. 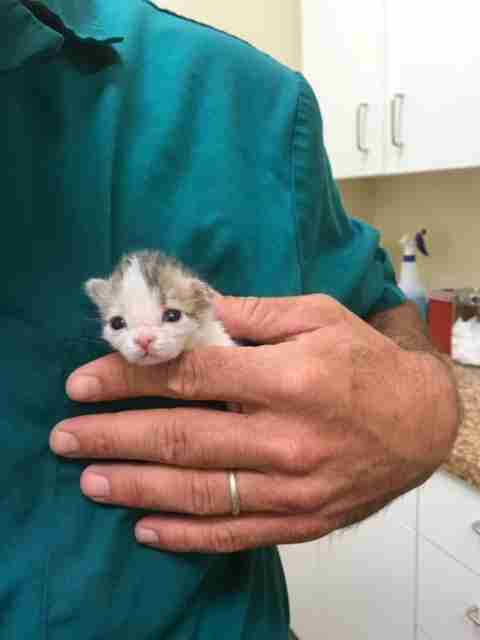 The vet didn’t expect her to pull through, and the family was heartbroken. They had just found out the kitten they’d brought to the humane society hadn’t made it, and it seemed like Gemma might end up meeting the same fate. Burke quit her summer job to dedicate all of her time to nursing Gemma back to health. 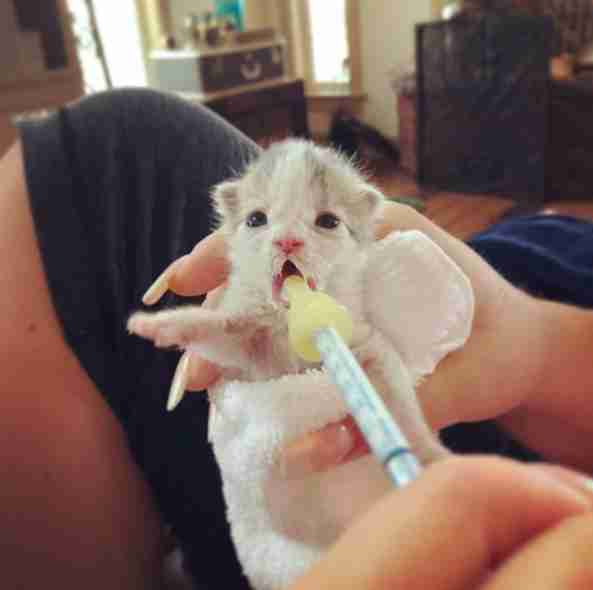 The kitten needed round-the-clock care, as she was so small and sick, but Burke refused to give up on her. “I didn’t know if she was going to live or die, and she scared us several times after that by stopping breathing … but she miraculously pulled through,” Burke said. 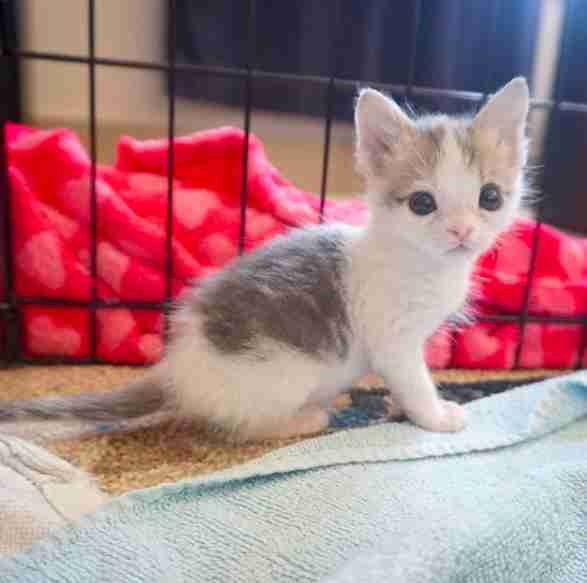 Despite all the odds, by the time she was a month old, Gemma was finally so much healthier and acting just like a normal kitten. She’s now 6 weeks old, and has just started eating wet cat food on her own. She hasn’t really grasped the concept of drinking water yet, and instead dunks her face in the water bowl and licks the water off her face. Her favorite activity in the world is cuddling with Burke — the person who saved her life even when everyone else had given up on her. You can follow Gemma on her Instagram account.